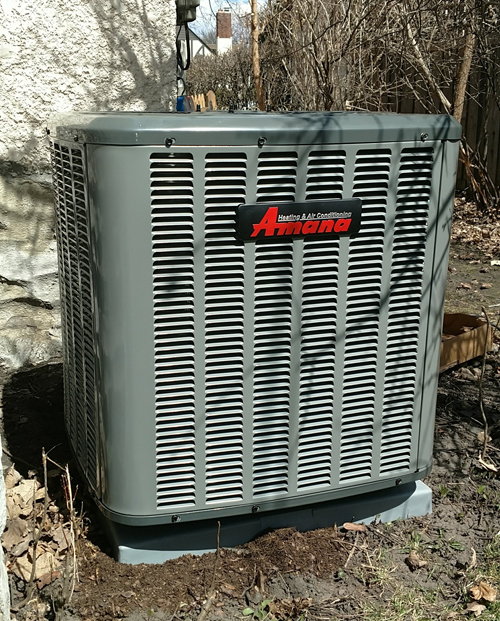 Spring is here in Minneapolis and many homeowners are contemplating replacing their old air conditioners instead of attempting to repair them. Mill City Heating & Cooling has found that the main items to consider when thinking about replacement are the age of the air conditioner and how often the air conditioner has been repaired in the past. The majority of an air conditioner’s parts have been designed to last 10-15 years and are less energy efficient than newer models. Furthermore, most air conditioners that are over 10 years old have the old R-22 refrigerant that is being phased out by the EPA, making it costly to charge or refill once the refrigerant has leaked out. Additionally, just finding and repairing the leak itself adds to the expense of keeping old AC units. About a week ago our office received a call regarding this matter from a property owner in the Longfellow neighborhood of Minneapolis, MN 55406. The owner of the property informed us that the air conditioner in one of his rental units had been charged with R-22 refrigerant the previous year and that he paid $720 for the service call and charging. The tenant of the property had informed the owner that the air conditioner was not cooling as well as it was at the end of the summer. New renters were moving in May 1st and the property owner wanted to make sure the air conditioner was working properly and would last through the summer. Once we arrived at the location, we found the air conditioner completely empty of refrigerant, indicating one or more leaks in the system. The customer was given the options of repairing the unit or replacing it completely. We informed the customer that even if we find all the leaks and repair them, we couldn't guarantee that other parts of the air conditioner system would not fail during the summer due to the age of the unit. Our customer chose to replace the air conditioning system and is extremely satisfied with his decision.